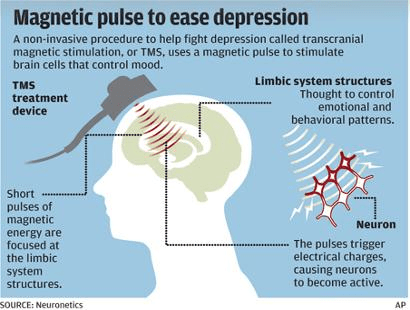 TMS therapy is a new and novel type of brain stimulation that treats depression using brief electromagnetic pulses (significantly weaker than those used in an MRI machine). These pulses pass through the skull easily and stimulate neurons in underactive regions of the brain thought to be responsible for depression. First approved in 2008 it is an effective form of treatment against drug-resistant depression. This type of therapy has been demonstrated to be safe, well tolerated, and effective in numerous clinical trials and double-blind studies, with little to no side effects. Tens of millions of people around the world have received TMS therapy. Research shows it to be at least as effective as antidepressant medication. Close to 70% of patients receiving TMS therapy will feel some benefit and relief in depression symptoms - half of those patients will be in full remission after treatment. No. But it might be mildly to moderately uncomfortable for the first few sessions as the patient gets used to it. It depends on the individual. In the great majority of patients, Transcranial Magnetic Stimulation is a well tolerated and very safe procedure. Most people describe TMS as a mild tapping sensation where the stimulator coil is being applied. The sensation of the pulse may feel similar to a TENS unit. Most patients report feeling positive benefits of TMS therapy even some years after their initial treatment. In most cases, effects can be felt up to a year. If needed, maintenance therapy sessions can be done. We accept most major insurance plans and patients should call their insurance or our office if interested in a consultation. Prior history records are required. How is TMS therapy performed? TMS therapy is applied by a device with a stimulating coil. The patient sits reclined in a comfortable chair while the technician takes some measurements of the patient’s head. Once appropriate measurements have been made to determine the optimal location of the coil placement, the technician then places the stimulating coil on the patients head and starts treatment. This treatment typically lasts up to 19 minutes. This is conducted over a 4-6 week time frame of daily sessions. After each session, the patient can drive home or back to work unassisted and can immediately resume normal daily activities. What do TMS effects feel like? Most patients report increased energy, focus, and motivation to perform activities and hobbies in as little as 5-10 sessions. Many patients describe the therapy as life-changing. Often times family members will notice effects before the patient does. As functional MRI imaging has clearly demonstrated, TMS increases blood flow to the area of the brain being stimulated, and if done repetitively also increases gray matter density. For more information call us at 716-886-5493 or Contact Us Today.